It’s not every day that a weak transom leads to major life changes, but that’s what happened to Vince Miragliotta. He’d been boating, skiing and just kicking back after selling his interest in a successful technical recruiting company when he noticed trouble with the transom of his 23-foot 2005 Scout center console. In most cases, that would have been the end of it. However, during the repair process Miragliotta, 56, got to know the owner of the company, Michael Borrelli, who specializes in restoring classic fiberglass boats to 35 feet at a 7,500-square-foot facility in Halifax, Mass. “Mike’s enthusiasm is catchy. He’s got a lot of passion for what he does,” Miragliotta says. 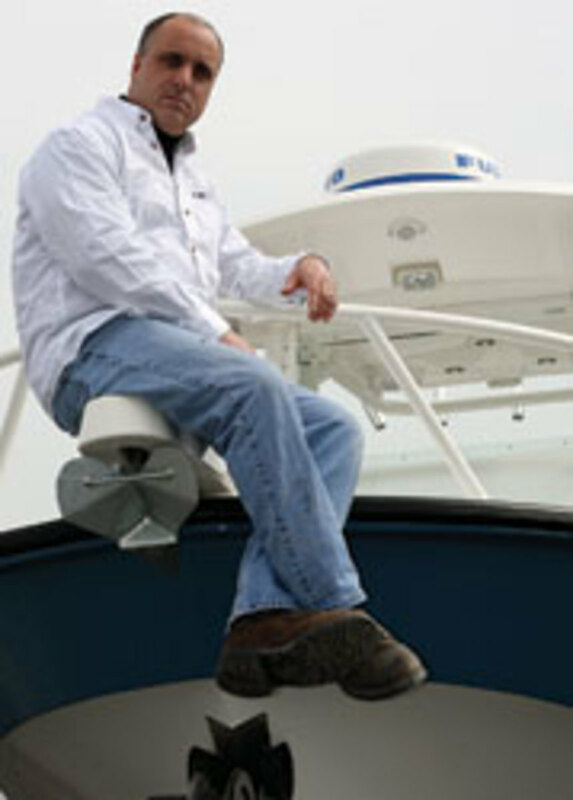 One thing led to another, and in June 2010 Miragliotta joined Metan Marine as full-time national sales director. Two months later he purchased a 50 percent share in the company. You could say Miragliotta put his money where his mouth is, betting cold, hard cash on a hoped-for continuation of an upward trend in the restoration of classic fiberglass power- and sailboats that date from the early 1960s. 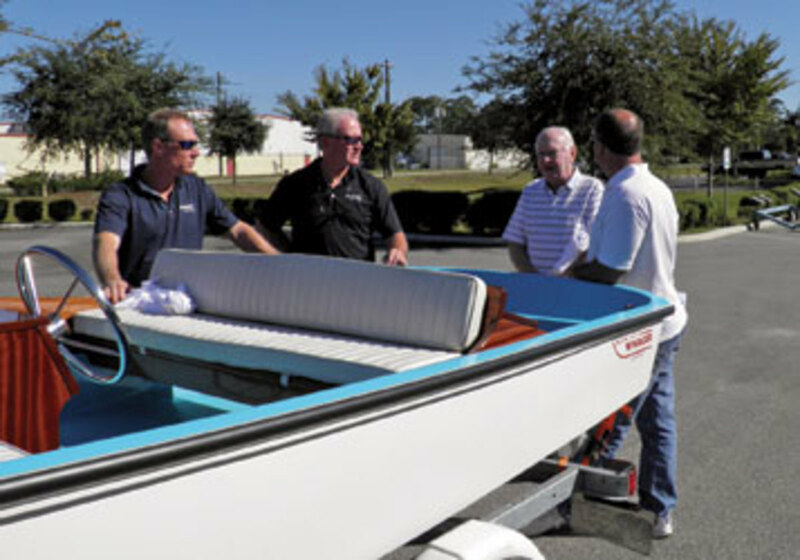 The small-boat category of classic restorations represents a segment of the marine business that will continue to grow, even in tough economic times, he says, adding that growth in demand for fiberglass repairs also will remain robust as more people keep the boats they own instead of buying new. The story is in the numbers. From 2009 to 2010 Metan Marine’s gross sales revenue increased from $500,000 to $900,000, according to Borrelli, the company president. He expects gross revenue to increase to $1.2 million this year, keeping Metan’s nine full-time employees busier than ever. Demand for restorations accounts for much of the company’s growth, Borrelli says. “Our current backlog of restorations is … double what it was in 2010, up from six restorations to 12,” he says. 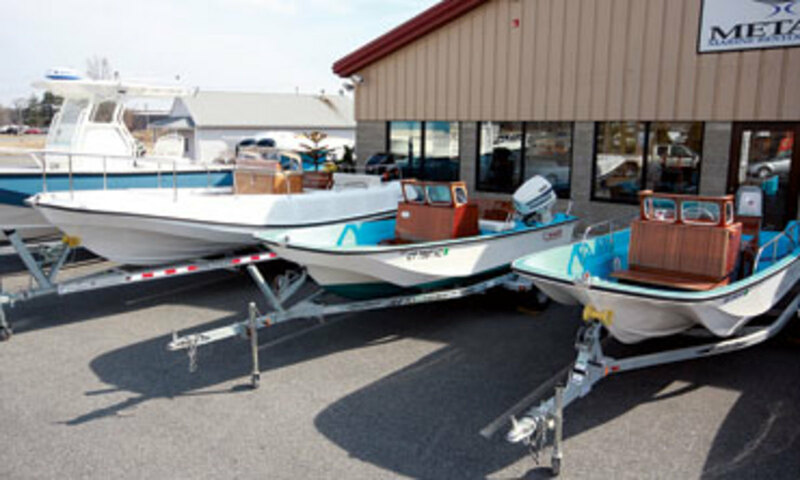 Although the company restores all kinds of boats, it specializes in powerboats — particularly SeaCraft and Boston Whaler. About 10 percent of the restoration work involves sailboats. A basic restoration of a 13-foot Boston Whaler costs about $20,000, which includes replacing the foam, as well as installing a new transom and new mahogany and hardware. Restoring a 23-foot SeaCraft fully loaded with electronics, new teak, a new engine, a molded fiberglass hardtop, Awlgrip and many other upgrades costs about $125,000. The restoration process essentially entails taking the boat apart and putting it back together. A new stringer system is constructed, a new deck is built of vacuum-infused epoxy, hatches are reconstructed, and new hardware, electronics and engines are installed. After the hulls are stripped and repaired, they are finished with Awlgrip. Borrelli equates the process to remanufacturing the boats. Metan Marine hasn’t known only good times. In late 2008, just as the industry was imploding along with the world economy, Borrelli became severely ill and was laid up for several months. “The business declined dramatically,” he says. Borrelli started Metan Marine in 1993 after working as a car mechanic, doing bodywork and running an auto parts distributorship. Metan evolved from restoring a 23-foot 1972 SeaCraft in a shed he built from shrink-wrap in the backyard while he worked two or three other jobs to support the new venture. By 2004 the company had grown into a full-service fiberglass boat restoration and repair business. Metan also did production painting of hulls for Boston-based MJM Yachts. In addition to Metan, a host of small marine businesses occupied the company’s 14,000-square-foot marine center in Rockland, Mass., as tenants. In 2008 the company’s gross revenue “flirted” with $800,000. It wasn’t easy. As the marine industry continued to slide into the abyss, tenants decided not to renew leases. Restoration projects and fiberglass repairs fell off. The situation looked dire, he says, noting that he had concentrated too much on being a landlord and running the marine service center instead of focusing on the restorations and the fiberglass repairs that were the core of his business. Borrelli sold the building in Rockland and in March 2010 moved into his current facility. His timing was good. People with beat-up center consoles and other powerboats were more inclined to fix them than to buy new boats, generating plenty of demand for fiberglass repairs. Repowering brought in lots of new business, too, because the process often revealed weakness in the transom that had to be corrected before a new engine was installed. “We’ve seen an increase in the transom repair business,” he says. In the 1970s builders such as SeaCraft, Boston Whaler, Grady-White, Mako and others included teak or mahogany consoles, seats, trim and louvered compartment doors. Builders began phasing out wood details during the 1980s, making wood on a classic all the more appealing to the eye. Metan applies 10 to 15 coats of epoxy to all mahogany and teak for ease of maintenance and finishes the wood with four or five sprayed coats of clear acrylic urethane. “Customers love seeing the boats restored and they go absolutely ecstatic when the wood goes in. The wood details are a centerpiece of a restoration,” Borrelli says. The company relies heavily on the vacuum-infusion process in restorations and in fiberglass repairs for all kinds of components, including transoms. Borrelli cites better layup, enhanced quality control and decreased negative environmental impact as key advantages to using vacuum infusion. Metan’s sales are split nearly evenly between restorations and repairs, indicating that the company has found a balance within a niche segment of the marine business. Its primary market is New England, Miragliotta says.